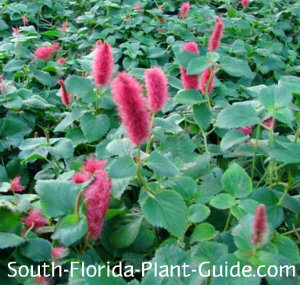 Dwarf chenille forms low mounded pillows of green topped with fuzzy tufts of red flowers. Happiest in part sun to part shade, this well behaved ground cover blossoms on and off all year, more during warmer weather. It's easy to keep in bounds and can work as a front of the border plant for foundation beds or other garden areas. The pretty flowers stand upright and contrast well against the plant's foliage. As the blossoms die off they do turn brown but soon disappear. A miniature version of the chenille plant shrub, this low grower is excellent in containers and hanging baskets, and in planters to let it cascade down a wall. Dwarf chenille grows about 6 inches tall and will grow - and flower - in almost any light, full sun to part shade. This is more of a moderate grower, even slow by comparison to many other groundcovers. Chenille needs the warmth of Zone 10 to do well in the ground, but in Zone 9B it can be used in a container to be moved indoors during winter's cold spells. Add top soil to the hole when you plant. You can also add in composted cow manure to enrich the soil around the plant's roots. No trimming is necessary other than to keep any wandering shoots in bounds. You can give the plant a good spring "haircut" (even mow over it) to encourage new growth. Water on a regular basis but don't keep the area overly moist. Fertilize once or twice a year - in spring and late summer - with a quality controlled release fertilizer. Place these plants 2 to 3 feet apart. They can go as close as 2 feet from taller shrubs, though from time to time you may have to snip shoots that grow into a nearby shrub. Come in from walks and drives 2-1/2 to 3 feet to leave room for future growth. Chenille will cascade nicely over the sides of a container, working well in a hanging basket or surrounding a tall center plant in a large pot. COMPANION PLANT SUGGESTIONS: Japanese boxwood, pinwheel jasmine, firespike, dwarf tibouchina, variegated arboricola, dipladenia, and foxtail fern.